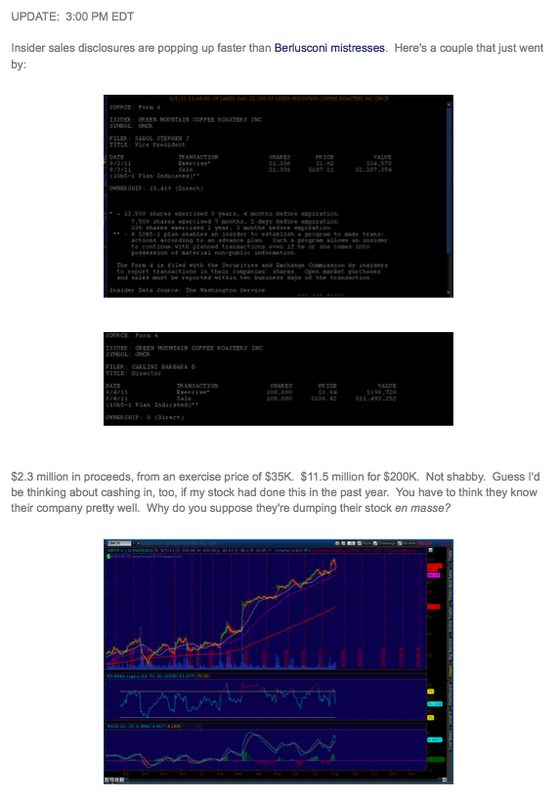 Worth keeping an eye on these things, folks. 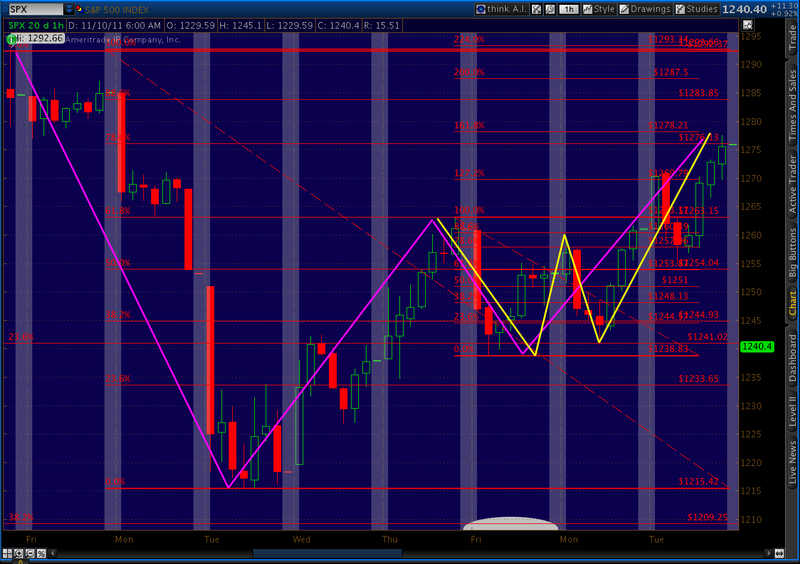 Dill just correctly pointed out a potential bullish Butterfly that began with Point X at 1215 the other day. If the bearish Butterfly we’re working on right now plays out, taking us to a Point C at 1258 or 1267 as mentioned in the 11:30 update, then look for the reversal to 1199 or so. It would be the Point D of the new Butterfly, as well as the 50 SMA and the 1.272 target of Tuesday’s Butterfly. Is that confusing enough? I’ll draw a chart, but you won’t like it. For harmonics traders, this is what I would call a target-rich environment. Too many targets, in fact. The Butterfly we’re watching play out right now is the small yellow one to the right. 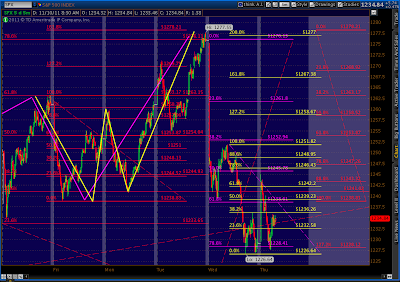 It targets 1258 or 1267. From there, some reversal targets include the 1.272 at 1218 or the 1.618 at 1206. I mostly favor 1218 because, being right next to 1215, it would maximize confusion and ambiguity, a hallmark of this market. The Butterfly Dill mentions (shown in white) puts in a Point C at 1258 or 1267 and heads for a Point D of 1199 or 1177. Naturally, if we pass though 1215, this will be much more likely and clearly violates my line in the sand. Then, there’s the original larger Butterfly pattern I mentioned a couple of days ago when we completed the Gartley. 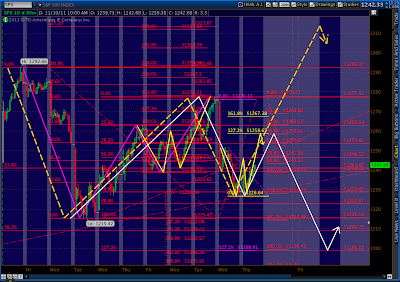 That pattern, as you’ll recall, would take us to 1313. It’s shown above as the green dashed line. So, there you have it. Lots of choices. FWIW, my gut is that we’ll reverse at 1258, head down to 1210-1215, then either collapse or take one last shot at 1313. The .786 at 1228 has, as we expected earlier, continued to be tested this morning. 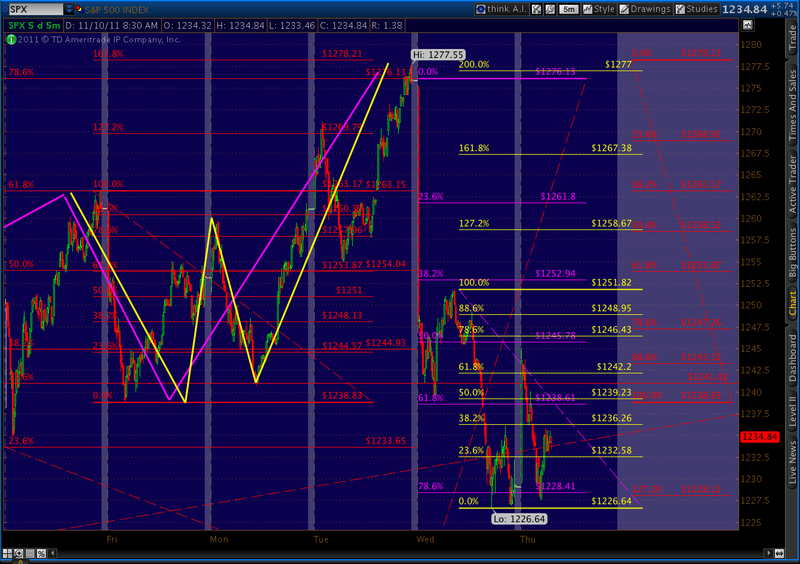 In fact, the testing has taken on the form of yet another Butterfly pattern (bright yellow Fib’s). If it plays out, it could take us back to 1258 or 1267 (the 1.272 or 1.618 fib levels) before reversing. The Gartley and Butterfly patterns we were watching played out perfectly. The question now is how large the move down will be. Typical targets revolve around a retracement or extension of the DA leg, ranging from .618 to 2.618. Here are the patterns themselves. 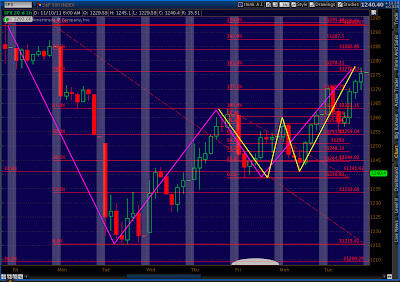 The purple Gartley pattern and the yellow Butterfly pattern completed within 2 points of one another at 1276 and 1278. 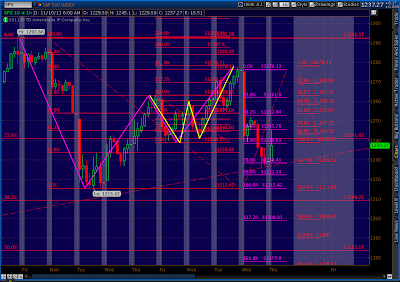 The initial target of a Gartley is .618 of the DA leg, which would be 1238.61. SPX’s initial plunge in roughly the first hour of trading was 1239.58 — 1 pt from our target. Not too shabby. 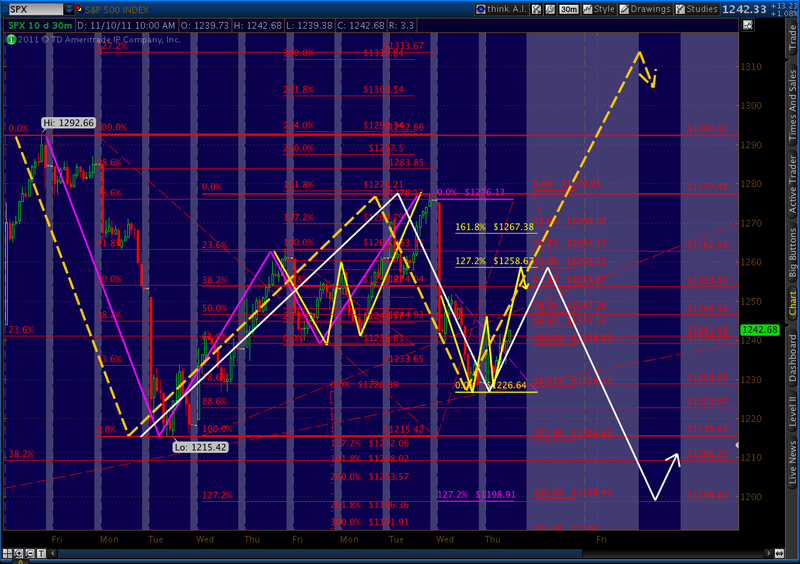 Now, take a look at the purple Fibonacci markers to the right of the chart. These mark all the retracements and extensions of the Gartley DA leg. The 1.618 extension is generally considered a pretty robust move; it stands at 1177.90. Although any fib level before that can and likely will provide a bounce or even a reversal. Note the close yesterday right at the .786 level. The Butterfly pattern DA leg Fib levels are indicated in red. 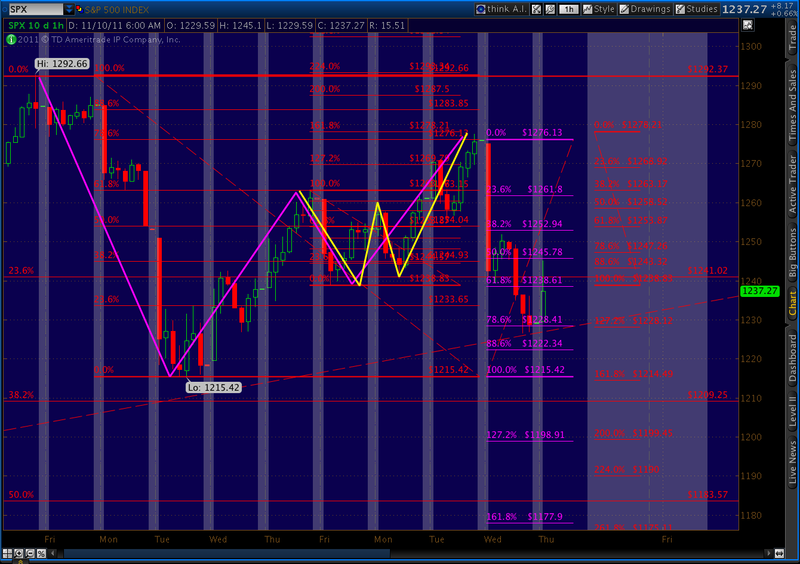 A Butterfly pattern typically pays off more than a Gartley, so a 1.618 extension is fairly routine. That would take us down to 1215 or so. As I wrote yesterday, 1215 is pretty much a line in the sand for me. A fall below that level makes one last leg up look much less likely, while a hard bounce at 1215 or above leads me to believe we’ll tag 1307 or 1313 by December 5 before the face ripping commences. But, keep an eye on these fib levels. We’re heading up, but I think it’s nothing more than a bounce at this point. Look for the market to at least retest the .786 fib (1.272 for the Butterfly) at 1228, and quite likely head down to 1215. Whether we go lower from there….we’ll just have to wait and see. There’s plenty of reason for us to continue down, but look for TPTB to pull a miracle stick save which, like all the others, is simply a baseless rumor. While all the attention has been on Greece and Italy lately, we have a rather momentous date with our own fiscal destiny with the supercommittee’s report due on November 23. Curious: like your thinking. Left to its own devices, I see BAC doing a belly up. But, will TPTB allow it? Prob not. Looks like it wants to head back down in the channel, but I'd keep an eye on the falling wedge. Might be good for a bump back to 6.50-6.75 before the next round of bloodletting. Casper: looks like a good count, although I'd feel better about an overnight gap if we had already nabbed 1258. Sorry, Dill, I missed it in all the excitement. See updated comments above. A bullish butterfly may be setting up using X as the 1215 low, A as Tuesday's 1277 high, and B as yesterday's touch and hold of 1228. If this is the case C should reverse around 1253 and D the 1.272 extension would be around 1199 … which also happens to be the 50 day MA. Based on his post yesterday, Daneric is considering (in my opinion) this is a corrective wave of Minor 2 up, and that it should touch the 50 and hold.